When Iran's new president nominated Mohammad Javad Zarif, a U.S.-educated former United Nations diplomat, to be foreign minister, some observers described the move as a possible "olive branch" to the West. But within Iran, it appears that's not necessarily a good thing. 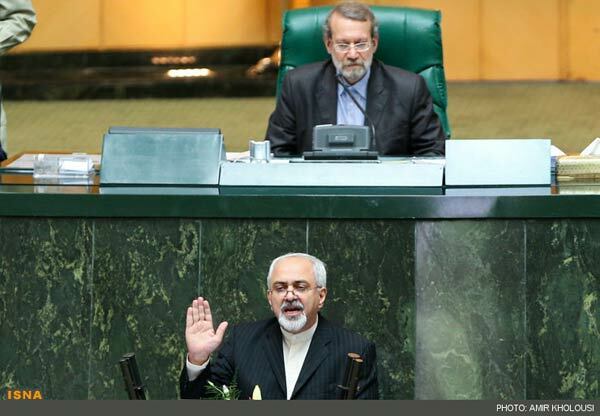 At an August 13 parliamentary hearing convened to consider President Hassan Rohani's proposed cabinet, lawmaker Nasrollah Pejmanfar used the description against Zarif. "Our enemies have set their greedy eyes on Zarif and Americans have called him an 'olive branch,' he said with the foreign minister-designate present. "Therefore, Zarif has to clearly announce that we don't want to have relations with the U.S."
The 54-year-old Zarif was Iran's top representative at the United Nations from 2002 to 2007. He studied international relations at San Francisco State University before earning a doctorate in international law and policy at the University of Denver. While he has earned praise for being pragmatic and open to talks, Zarif has been criticized by Iranian hard-liners for allegedly being too friendly with the West, holding Western views himself, and even trying to become a permanent resident of the United States. "Nuclear energy is our absolute right. But the question is whether you agree or whether you are ready to make a deal over our national interests," Pejmanfar continued, addressing Zarif directly. Another lawmaker, Nader Ghazipour, suggested that because of his time in the United States, Zarif did not have enough knowledge of the Middle East. He questioned Zarif about his view of the uprisings across the Arab world that began in late 2010. The uprisings had been described by Iranian officials as an "Islamic awakening." "Do you accept the events in the Arab world as an Islamic awakening or do you not accept the Islamic term?" Ghazipour asked. 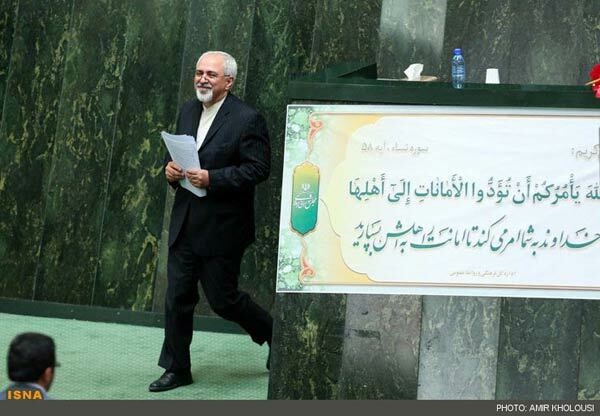 In the 30 minutes he was given to respond, Zarif made his case calmly and strongly in a speech that included references to Supreme Leader Ayatollah Ali Khamenei and ample quotes from the Koran. He indicated that if confirmed he would work to widen the circle of Iran's friends in the region and throughout the world, but said Iran would not abandon its sensitive nuclear program. "The message [of President Rohani's election] is the determination of the great people of Iran for respectful interaction with the world, without withdrawing even one iota from Iran's due rights," he said. The West suspects that Iran's nuclear activities are aimed at producing a weapons capability. Iran maintains its program is peaceful, but has not been fully transparent. The Iranian economy has been hit hard by Western sanctions levied in response. Zarif also defended his time at the UN and suggested that his meetings with U.S. officials had been held with the consent of the Islamic republic's top decision-makers. "There have been questions about my communications with some current U.S. officials," he said. "Some of these officials were once against the warmongering [U.S.] government. I communicated with them in the framework of my duties. I'm proud if I have been able to create a divide among those pushing for a war." In defending his studies in the United States, Zarif claimed his thesis focused on issues related to his country, including Western sanctions. He also appeared to respond to reports in Iranian media that former U.S. Secretary of State Henry Kissinger had once praised his diplomatic abilities. "Is it bad if an [experienced] 80-year-old diplomat calls a 40-something-year-old child of this revolution a 'worthy adversary'?" he asked parliamentarians. He also rejected claims that he had traveled abroad this spring to the United States to apply for a green card, which puts holders on a path toward eventual citizenship. Instead, he said he had spent much of his Norouz holidays pushing his mother's wheelchair. The hearing on August 14 offered a glimpse of the opposition that Zarif could face in the future from hard-liners who are suspicious of the "Great Satan" (as the United States is often called) and its intentions. Analysts say he will have to walk a fine line between appeasing hard-line factions and working to improve relations with the West. In outlining his plans for the Foreign Ministry that were published this week, Zarif wrote that he will try to prevent "unnecessary" tensions between Tehran and Washington. He is expected to be confirmed for the post. 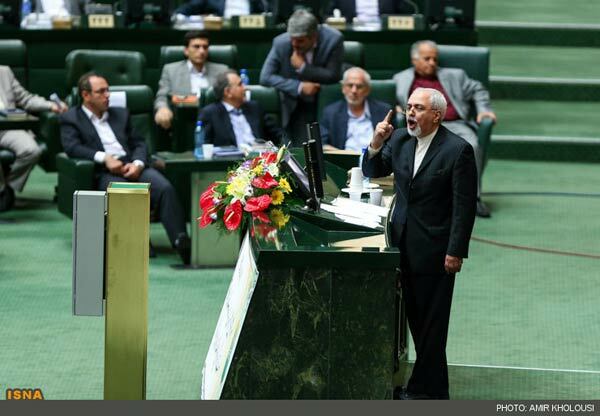 Zarif acknowledged to parliamentarians that he was aware of the difficult job ahead of him.